There’s nothing like coming home to hot chicken soup. I made this soup up on the spot last week with ingredients I had on hand. Substitute as needed. Combine all the ingredients in the crockpot and cook on high all day. 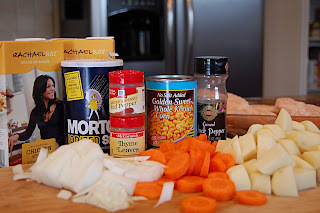 I love soup and this one looks delicious and so easy. I love this…and since I have a ton of leftovers from this weekend it’s perfect! Once again, you’ve come up with something tasty and easy! How long do you cook it for? All day? A few hours? Hola from Sits! I just thought I would stop by and say hello!!! :o) Have a good day! 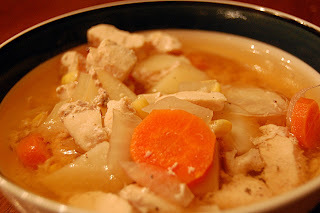 I made your crock pot chicken soup last night. I sauteed my onion with some fresh herbs I had and threw everything in. I also substituted spaghetti broken very small for the potatoes and no corn for a traditional chicken noodle. It was so yummy. The family raved about it and it was so cheap. Thank you. I just found your blog and I am looking forward to trying more recipes. Thank you for writing for us. Adriana, I’m going to have to try the spaghetti trick. That’s a great idea. Did you put the spaghetti in later or at the beginning with everything else? Tiffany – why on high and not low? I think I’ll put this on my menu this week.